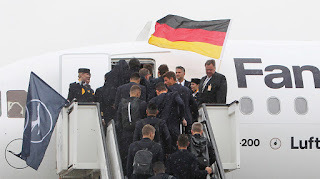 Germany landed in Moscow on Tuesday to attempt to successfully defend their World Cup title and hoping to leave the political controversy surrounding Mesut Ozil and Ilkay Gundogan behind them. The Germans took off from Frankfurt in pouring rain hoping captain Manuel Neuer will stay fit after eight months on the sidelines with a foot fracture. Their buildup was dogged by the controversy surrounding Ozil and Gundogan after the players, who have Turkish roots, were booed in pre-World Cup friendlies for meeting Turkish President Recep Tayyip Erdogan. The Premier League stars met Erdogan in London last month with Gundogan handing him a signed Manchester City shirt with the message “to my president”. German fans took a dim view of the perceived divided loyalty, by booing the pair in a friendly defeat to Austria. Gundogan has said the meeting was not politically motivated, while Ozil has refused to talk about it during the World Cup. “This is his statement, I assume he will stick to it,” said team director Oliver Bierhoff during the training camp in Germany. “Whether that is right or wrong is another matter,” added Bierhoff, who said the players did not act “maliciously”, but had been “naive”. Off-field distractions aside, the Germans arrived well-prepared. They are bringing 26 sets of jerseys among their 12 tonnes of equipment. Coach Joachim Loew said Germany’s rivals had all made advances. “There will be a high standard of opposition. Spain have improved, while Brazil and Argentina are up there.” Germany have won just one of their last six friendlies, but all the focus is on their opening game in Moscow on Sunday against Mexico. “The first group game is always a sticking point, because it tingles,” said veteran forward Thomas Mueller, who will lead Germany’s attack. The nervy 2-1 win over Saudi Arabia is now in the past. “There is no reason to blubber now, we are world champions,” added Mueller. “We have many players who are in a fit state.” The Germans hope that particularly applies to Neuer, the world-class Bayern Munich goalkeeper who has played just two matches since fracturing his foot last September.